Back in July I recreated a yard sale find ..... Dangly Necklace . At the time, I liked it a bit, however, it was just my second attempt at necklace making. I wore this twice while on our cruise in October without a single comment. I partake that to mean that it's not to great ... and being realistic ... it really isn't. It's been sitting on the sideboard for the last two months awaiting consideration. (Unfortunately, there are a variety of items over there). Todays' the day. I turned the page in the jewelry books I've been working through and there are general instructions for a charm necklace. 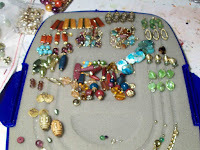 Much like the cascade pieces, calling for a multitue of bead sets. This is in my particular interest in jewelry ... I like these crowded pieces, versus simple single strand bead necklaces. Took the Dangly Necklace back apart and divided wired beads into singles. Then, pulled out the vintage collected drawers, as well as the bead drawers and made selections within the color scheme of the wired stone beads. 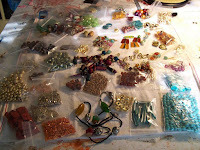 A few of the bead packages are new, but most of the selections are yard sale finds that have been taken apart. Spent a couple hours putting together a multitude of bead sets. I'm thinking these will become the basis of 2-3 pieces.